LAST-A-FOAM® RF-2200 is an advanced dielectric material for use in radomes, antennas and other radio frequency (RF) communication systems. This series of machinable, closed cell polyurethane foams provide an RF-transparent, low-loss protective layer for applications requiring optimal performance where electrical insulative materials are needed. Its Tg exceeds 350°F, increasing the customer’s processing window through improved thermal mechanical properties. This makes it suitable for processing high-temperature composite prepregs, such as those found in radomes and other panels. This closed-cell polyurethane foam does not absorb water, ensuring signal performance. Standard densities are available in 3, 4 and 6 pounds per cubic foot, and other densities can be provided to meet specific dielectric constant and loss tangent requirements. 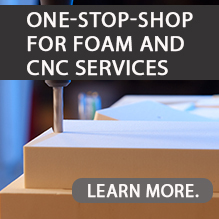 These foams’ electrical properties have been fully characterized by free space analyzer transmission tunnel testing to assure users this foam will perform as expected. Dielectric property information for LAST-A-FOAM® products. The low density of the material makes it easy to handle and process, whether machining to a final shape, assembling into composite panels, or installing panels in a space-frame radome. Shown are maximum standard stock based on density. Custom sizes are available. Cut sizes are available from 0.125 inches (3.175 mm) up to standard stock heights as listed above.